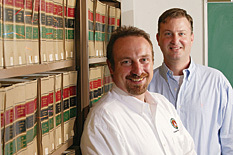 Pictured, left to right: DataStream President Mark Anstey and Chief Information Architect Ed Schulke. Photo by Ron Solomon. Mtech TAP incubator graduate DataStream Content Solutions LLC (DSCS) announced its acquisition of Open Personalized Health Informatics (OpenPHI). OpenPHI offers technologically advanced solutions, tools and data for the health and health related industries. Using cutting edge technology, OpenPHI delivers impressive services such as: Health Librarian, which utilizes a semantic search engine to intelligently sort and categorize health information from across the web; HealthAlbum, which allows true portability of personal health records; and HealthFraud Preventor, which uses the power of geocoding to run algorithms against data sources to identify potential trouble spots. "OpenPHI provides the very latest in technological innovation as applied to data in the health field," says Mark Anstey, president of DSCS. "We see adding OpenPHI as a natural fit to expand the DSCS family of companies, already including Potomac Publishing and ATLIS Publishing and Graphic Services. They understand how we approach technology and data already but offer us expertise in the health fields. We will be able to offer more services to existing clients as well as expand our client base into new areas." "We are very excited to be joining the DSCS team," says Jose C. Lacal, President of OpenPHI. "The passion for applying advanced technological solutions to information issues was evident in both groups. What we can accomplish together will be truly ground breaking and will cut across industries." DSCS is the home of the revolutionary Legislative Impact® and Regulatory Impact® and is a leader in intelligent mark-up of data, while OpenPHI has pushed the boundaries of semantic search, cloud computing and open access. Both companies look forward to sharing proprietary technologies in order to improve products and services for all existing and future customers.